For the past 25 years or so there has been a lot talk about how vaccinations are causing cancer in cats. As you would imagine this is quite a hot topic with many opinions. We thought we’d ask our favorite feline expert in all things cat-ish, Newton, to shed light (but not fur!) on this topic. People often ask us if we vaccinate our cats who are 100% indoor cats – we do not. A veterinarian recently posted this on his Facebook page. In the late 1980’s veterinarians in the northeastern part of the US started noticing cancerous tumors (fibrosarcomas) in young cats. This was surprising in itself, but these tumors were also occurring at sites where vaccinations are normally injected. Why did the tumors appear at vaccination sites? The tumors are not caused by the antigen (e.g. rabies virus) itself. Killed viruses are often used, but to increase the immune response an adjuvant is added. This adjuvant also causes inflammation and sets the stage for a potential tumor. I could find no evidence that trauma from the needle itself was related to cancer. However, your veterinarian should use the smallest needle (25 g) to make the injection as painless as possible for Kitty. Vaccination protocols are under constant review and are revised by the American Veterinary Medical Association (AVMA) and the American Association of Feline Practitioners (AAFP). http://jfm.sagepub.com/content/15/9/785.full.pdf+html All kittens should be vaccinated since maternal antibodies only provide temporary protection. Adult cats should be examined yearly and only vaccinated if they are high risk based on their age and lifestyle. Antibody titers (obtained from a blood sample) can determine if your cat has adequate immunity. 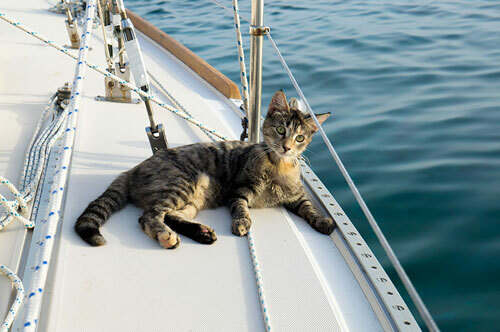 What can you do to decrease your cat’s risk? Discuss the need for any vaccinations with your veterinarian. Please note that, despite human health concerns, feline rabies vaccination in NOT required in all states. https://www.animallaw.info/topic/table-state-rabies-laws-concerning-cats If you do not wish to vaccinate adult cats you can ask for an immunity titer. If you do vaccinate insist on vaccines that DO NOT CONTAIN ADJUVANT. Did the presence of leukemia disappear in these “miracle cats”? According to the video 10 cats who had tested positive for FeLV were negative when retested later. This is almost 50% of their usual FeLV positive population. Exact time frames and type of test used are not given, so I have to make some educated guesses regarding what happened. ELISA detects both primary and secondary viremia, but cannot differentiate between the two. IFA detects only the secondary stage. If the ELISA was positive on a pet cat a blood sample would be sent for IFA to provide an accurate diagnosis. However, shelters typically use only the cheaper in house tests. A positive test means the cat will be euthanized or housed solely with other FeLV positive cats. So what happened at the Shadow Cats shelter? ELISA can give false positive results so some of the cats might never have had FeLV. Some of the cats may have had only primary viremia. Although reversal of primary viremia is not common, it can occur. IMPORTANT! I do need to clarify something. 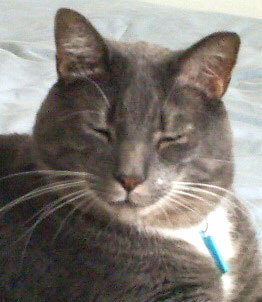 The narrator used the term “shed” several times when describing cats who no longer tested positive. He does not understand and is misusing an important medical term. Not understanding what “shed” or “shedding” really means could have fatal consequences. Shedding means that the cat is releasing the virus – much like that period of time when one human is contagious and can transmit a nasty cold to another human. When a cat is shedding a virus this is a period of time when the virus would likely infect other cats in the environment. What he should have said is that the cats no longer had the virus in their bodies so they were not carriers any longer. This is why it was safe to move them out of the isolation area. I do wonder what prompted them to retest the first FeLV positive cat. Prior to the surprising negative result they had no protocol for retesting. The cats in the video certainly looked healthy and well cared for. Their environment appeared to have minimal stress – something that is critical both for preventing and for curing disease. Either the miracle cats never had FeLV, or they had the stage that is reversible. A nurturing environment helped the FeLV positive cats to fight off the disease while it was still in the early stage. It certainly makes a case for retesting FeLV positive cats, both after the initial positive results (to rule out false positives), and after being housed away from non-infected cats for some time (to see if cats in the primary stage had fought off the virus successfully). 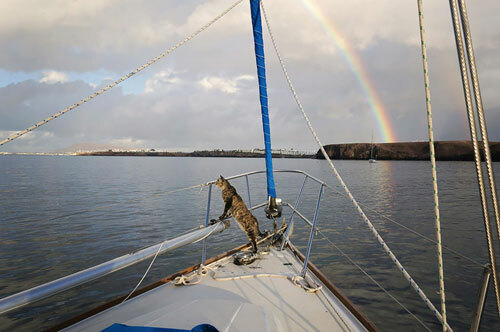 Meet a cat who travels the world on a boat! Ahoy mates! Have you ever dreamed about saying bye-bye to all that binds and holds us back and saying to hello to a life of total freedom and adventure? And with your cat? What better way to continue the 4th of July celebration freedom than by meeting Matt and Jessica Johnson who quit their jobs, sold everything and in August of 2011 they set sail around the world. 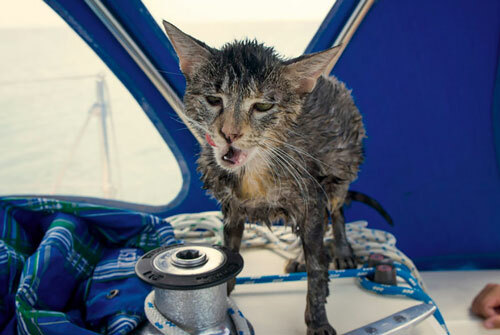 A year later they adopted a cat named Georgie who not only loves living on the boat, but loves a good swim! Inspiring story. Great photos!